​ Recreation, W.S.King school on Fisher Street in Morehead City. 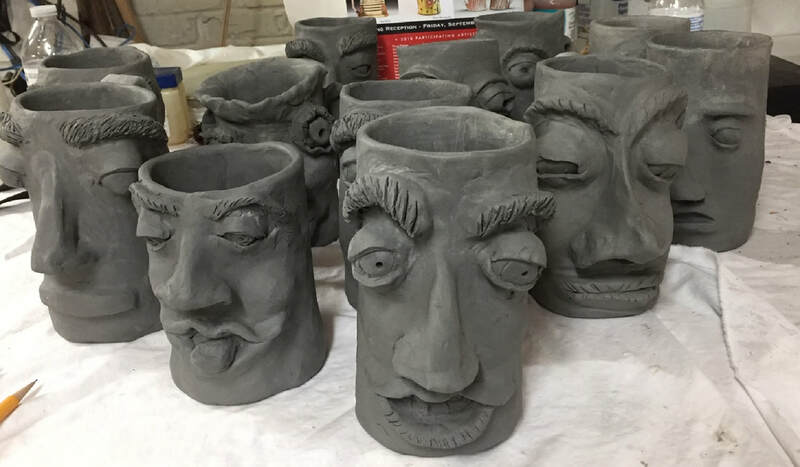 Based on Head Jugs, Face Jugs and Ben Watford's Ugly Jugs, Carolina Artists Gallery designed a three session introductory clay class opened to the public. These mugs have been successfully fired and will be glazed and fired again to end up brightly colored a ready for use. Special thanks to co-teachers Jamison Ipock, and Marie Smith. ​Special Hands Clay Workshop will begin a new series of classes beginning January 3, 2019!!! Students will be challenged to make MUG MUGS- a version of Head Jugs.